Richard Joseph Gannon (born December 20, 1965) is a former American football quarterback who played eighteen seasons in the National Football League (NFL). He is a sports commentator with CBS Sports and Sirius XM NFL Radio. Gannon was born in Philadelphia, Pennsylvania and played college football at the University of Delaware. At Delaware, he directed coach Tubby Raymond's Wing-T offense. He recorded at least 2,000 offensive yards for three straight seasons at Delaware and was Yankee Conference Offensive Player of the Year as a senior. In the 1987 NFL Draft, the New England Patriots selected Gannon in the fourth round intent upon converting Gannon to running back. He was soon traded to the Minnesota Vikings and would play with the Vikings until 1992. Gannon began his career as a backup for Wade Wilson. Gannon started his first games in 1990 in relief of an injured Wilson and would start many games in 1991. In 1992, he formally became the starting quarterback for the Vikings and led the Vikings to an 11-5 season and the playoffs after two consecutive losing seasons. Gannon played with the Washington Redskins in 1993, the Kansas City Chiefs from 1995-98, and the Oakland Raiders from 1999-2004. With the Raiders, he achieved his greatest successes, including four consecutive seasons making the Pro Bowl (1999-2002), three consecutive postseason appearances for the Raiders (2000-2002), two All-Pro selections (2000, 2002), one MVP, and an appearance in Super Bowl XXXVII played on January 26, 2003 at Qualcomm Stadium in San Diego, California. However, Gannon spent much of his final two seasons (2003 and 2004) with injuries, and the Raiders had losing records in those seasons. After retiring from football before the 2005 season, Gannon began a career in sports broadcasting. Currently, he is a sports analyst for NFL on CBS and co-hosts The Sirius Blitz on Sirius XM NFL Radio. Gannon attended Saint Joseph's Preparatory School in Philadelphia, Pennsylvania and won three varsity letters each in football and crew, and twice in basketball. In his senior season, he won first team All-City as a punter and quarterback. He threw for 1,567 yards his senior season. Gannon attended the University of Delaware where he was a member of Sigma Phi Epsilon. In football, he was coached by Tubby Raymond and played within Raymond's wing T offense. With the Delaware Fightin' Blue Hens football team, Gannon first played as a punter before switching to quarterback in sophomore year. Gannon set 21 school records, including total offense (7,432 yards), passing yards (5,927), pass attempts (845), and completions (462) and was the only Delaware player at the time to achieve at least 2,000 yards of offense three years in a row. As a sophomore, Gannon won the Eastern College Athletic Conference Division I-AA Rookie of the Year award in 1984. In 1986, during his senior season, Gannon won Yankee Conference Offensive Player of the Year honors and was an honorable mention All-American selection. When he led the Raiders to Super Bowl XXXVII in 2003, he was the second player from the University of Delaware to go to the Super Bowl. Gannon was selected in the 4th round (98th overall) of the 1987 NFL Draft by the New England Patriots, who envisioned converting him to a running back. Gannon balked at the idea, and he was quickly traded to the Minnesota Vikings. Gannon began his career with the Vikings as a backup to starting quarterback Wade Wilson. Gannon played four regular and one postseason games in his rookie season of 1987 and accumulated statistics for the Week 10 (November 22) game, a 24–13 victory over the Atlanta Falcons. He completed 2 of 6 passes for 18 yards. Gannon also rushed for 3 yards in the Vikings' Wild Card game, a 44-10 win over the New Orleans Saints. That game was the first playoff game in Saints team history. The 1987 Vikings finished the season 8-7 and lost the NFC championship game to the eventual Super Bowl XXII champion Washington Redskins. For the 1988 season, Gannon was third-string after Wade Wilson and Tommy Kramer. Gannon played three games in 1988. In a Week 5 (October 2), 24–7 loss to the Miami Dolphins, Gannon completed 7 of 15 passes for 90 yards but was sacked twice for 15. He also rushed twice for 15 yards. Gannon took a knee in the Vikings' Week 8 (October 23) victory over the Tampa Bay Buccaneers. In Week 10 (November 6), Gannon was sacked for 7 yards and rushed for 15 yards in a 44–17 win over the Detroit Lions. Improving from 1987, the 1988 Vikings finished 11–5 and advanced to the divisional round of the playoffs. Gannon did not play at all during the regular season, during which the Vikings went 10–6. In the Vikings' postseason divisional playoff game, a 41–31 loss to the San Francisco 49ers, the Vikings used all three quarterbacks (Wilson, Kramer, and Gannon), and Gannon was 13-for-18 passing for 144 yards and 1 interception. He rushed for 7 yards and was sacked twice for a total 20 yards. Gannon started his first game in Week 4 (September 30) of 1990 after Wade Wilson had torn thumb ligaments. The Vikings lost that game to the Tampa Bay Buccaneers in overtime 23–20. Steve Christie kicked the winning field goal for Tampa in a drive started from a Wayne Haddix interception of a Gannon pass. Gannon would play 14 games in 1990 and start 12. Gannon won his first career start in Week 9 (November 4) with a 27–22 win over the Denver Broncos. John Elway, starting quarterback for the Broncos, left the game due to injury after building a 16-0 first-half lead for Denver. Gannon made the winning touchdown drive on a 56-yard trick play pass: first to Herschel Walker, who pitched back to Gannon, who made a deep pass to Anthony Carter for the touchdown. Minnesota won despite Gannon completing less than half of his passes (6-for-13) and being sacked 7 times. The following week against the Detroit Lions, Gannon rushed for a one-yard touchdown and passed for 147 yards completing 12 of 17 passes as the Vikings won 17-7. These games began a five-game winning streak for Minnesota after a 1–6 start. However, the Vikings would finish 6-10 after losing the last four games of the year. For the season, he was 182-for-349 in passing for 2,278 yards and threw for 16 touchdowns and 16 interceptions. He was sacked 34 times and rushed 52 times for 268 yards. In the 1991 preseason, Vikings coach Jerry Burns demoted Gannon to third-string and elevated Sean Salisbury to second-string behind Wade Wilson. Gannon played his first game of the year in Week 5 (September 29) against the Denver Broncos, replacing Wade Wilson with 7:20 left in the fourth quarter after Wilson threw three interceptions. On fourth down and three yards (fourth-and-three) at Denver's 13-yard line with 43 seconds left, a wide-open Hassan Jones dropped Gannon's pass, and Minnesota lost 13-6. Gannon would replace Wilson as starter for the last 11 games of 1991, and the Vikings went 6-5 with Gannon as starter for an overall 8-8 season. Gannon was 211-for-354 in completed passes for 2,166 yards, 12 touchdowns, and 6 interceptions. He was sacked 19 times for 91 yards and rushed 43 times for 236 yards, including two rushing touchdowns. 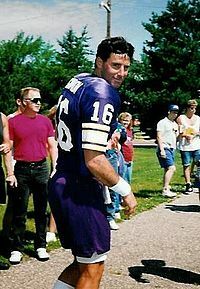 Competing with Sean Salisbury for the starting job, Gannon ultimately became the Vikings' starting quarterback for 1992. In the final exhibition game of 1992, and with first-year coach Dennis Green, he led the Vikings to a 30–0 defeat of defending Super Bowl champions Washington Redskins in the Redskins' home field, completing 14 of 21 passes for 124 yards and three touchdowns. In the fourth quarter of the Week 5 (October 4) home game against the Chicago Bears, Gannon led a Vikings rally from a 20–0 deficit to a 21–20 victory. Following a touchdown off an interception by Todd Scott, Gannon led a touchdown drive with four consecutive passes, the last one to Cris Carter in the end zone. With 6:40 left in the fourth quarter, Gannon led a 78-yard touchdown drive that included the Vikings' seventh straight first-down play of the game. The drive began with Gannon handing off to running back Terry Allen for a 21-yard rush, followed by a 22-yard rush by Roger Craig, who would make the tying 1-yard touchdown run, followed by the winning extra point kick. In Week 7 (October 15), Gannon started against the Detroit Lions and completed 8 of 10 passes for 146 yards and two touchdowns for a 24–0 lead. Salisbury took over in the second quarter after Gannon suffered a hyperextended left knee, and the Vikings beat the Lions 31–14. The Vikings now were a surprising 5–1 after going a combined 14–18 in the 1990 and 1991 seasons. With Minnesota leading the NFC Central with an 8–3 record, Dennis Green benched Gannon in favor of Salisbury following the Week 12 (November 23) win over the Cleveland Browns. On August 19, 1993, the Vikings traded Gannon to the Washington Redskins for a conditional 1994 fifth-round draft pick. Gannon was the third-stringer behind starter Mark Rypien and backup Cary Conklin. With the Redskins, Gannon played in eight games and started the four games from Weeks 12 to 15. Gannon played his first game of 1993 in Week 5 (October 4), a Monday night game, taking over for Cary Conklin against the Miami Dolphins and Dan Marino. Gannon could only lead one touchdown drive that brought Washington within a 14–10 deficit behind Miami. With 59 seconds left, Gannon threw an interception to the Dolphins' Troy Vincent to seal the Dolphins' 17-10 victory. Gannon injured his foot during the game. However, Gannon would play in limited roles in Weeks 6 and 7. After a 2–7 start, Redskins coach Richie Petitbon announced he would bench Mark Rypien and start Rich Gannon once Gannon recovered from the injury. In Week 12 (November 21) against the Los Angeles Rams, Gannon completed 24 of 39 passes for 170 yards, was sacked three times for 11 yards, and rushed twice for 18 yards. With Los Angeles leading 10–6 and 3:10 left in the game, Gannon missed an opportunity for a game-winning drive. At the Rams' 27, Gannon's 23-yard pass intended for Art Monk bounced off Rams safety Anthony Newman's hands and into Michael Stewart's hands for an interception, sealing the victory for the Rams. The following week (November 28), Gannon made two touchdown passes in the fourth quarter to give the Redskins a 14–10 lead over the Philadelphia Eagles. However, Philadelphia would win 17–14 on a touchdown reception by James Joseph. On 20-for-31 passing for 279 yards, Gannon threw two interceptions and two touchdowns that game. He was sacked five times for 27 yards and rushed four times for 25 yards. Gannon led the Redskins to a Week 14 (December 5) victory over the Tampa Bay Buccaneers, 23-17, starting with a cumulative 17-0 lead by the third quarter. Gannon completed 9 of 16 passes for 71 yards and rushed 7 times for 12 yards. Gannon's one interception that game came when Buccaneers defensive tackle Santana Dotson deflected the pass from the Redskins 8 and Ray Seals caught the ball in the Redskins' end zone for a touchdown. The score was 17-10 Redskins as the Buccaneers rallied with 10 unanswered points. In the Redskins' 3–0 loss to the New York Jets in Week 15 (December 12), Gannon was benched in the fourth quarter in favor of Mark Rypien, but the Redskins could not handle the Jets' defense. Gannon completed 7 of 15 passes for 62 yards (including one 50-yarder). On 74-for-125 passing (59.2 percent), Gannon passed for 704 yards with three touchdowns and seven interceptions and rushed 21 times for 88 yards and one touchdown. The Redskins finished 1993 with a 4–12 record, and Gannon was 1–3 as a starter, with the three losses all being within margins four points or less. Gannon sat out the 1994 season after shoulder surgery. In 1995, Gannon signed with the Kansas City Chiefs. For two years he served as a backup to Steve Bono. In 1997 a quarterback controversy was created when the Gannon-led Chiefs excelled in the absence of the injured Elvis Grbac. In the playoffs, coach Marty Schottenheimer elected to play Grbac instead of Gannon, and the Chiefs lost 14–10. The two ended up splitting snaps in 1998, after Grbac was injured in Week 1. In February 1999 Gannon was signed as a free agent by the Oakland Raiders. He excelled in Jon Gruden's West Coast offense and was voted to the Pro Bowl in his first year as a Raider – the first of four straight selections. In 2001 and 2002 he won the Pro Bowl MVP award consecutively, a feat achieved by no other NFL player. Gannon won the NFL Most Valuable Player Award after a record-setting 2002 season, throwing for 4,689 yards and 26 touchdowns and recording a career-high 97.2 passer rating, which helped the Raiders advance to Super Bowl XXXVII, making him the first former Blue Hens quarterback to start a Super Bowl. He was passing at a record pace with more passing yards than any quarterback in history through 14 games at the time but fell off the pace in the last few weeks. He led the league with 418 completions on 618 attempts. In the Super Bowl, Gannon threw a Super Bowl-record five interceptions – three of which were run back for touchdowns – in a 48–21 loss to the Tampa Bay Buccaneers. The Bucs' defense was aided by the fact that their new head coach was Jon Gruden, who had knowledge of the Raiders' playbook as well as Gannon's mannerisms and even some audibles, which Oakland coach Bill Callahan had left unchanged since Gruden's departure. Gannon's 2003 season was ended by a shoulder injury in Week 7 after a 2–5 start. A serious neck injury in 2004 effectively ended his career. Gannon was hurt in Week 3 when he scrambled, and slid into a helmet-to-helmet collision with Tampa Bay linebacker Derrick Brooks. When the Raiders signed Kerry Collins prior to the 2004 season, some thought that Gannon would be cut in favor of the strong-armed Collins, whom skeptics thought was a better fit in new coach Norv Turner's vertical offense. Gannon not only kept his starting QB spot, but thrived. He threw for 305 yards in the season opener against Pittsburgh, including a 40-yard touchdown strike to Doug Gabriel. The Raiders nearly won the game over a Steelers team that finished the 2004 season with 15 victories. The Raiders were a competitive team with Gannon as their QB, going 2–1 when he started and 3–10 after his injury. On August 6, 2005, Gannon officially retired from football and joined CBS television as an NFL analyst. He was inducted into the University of Delaware athletics hall of fame the same year. For his career accolades, Gannon was named the twenty-eighth greatest quarterback of the modern era by Football Nation. Gannon joined CBS Sports as an NFL game analyst in August 2005. He also works as a game analyst for Green Bay Packers preseason games. As of 2009, Gannon also cohosts The Sirius Blitz on Sirius XM NFL Radio with Bruce Murray weekdays from 11:00 am to 3:00 pm Eastern time. Gannon's father-in-law was former Minnesota Vikings running back Bill Brown. Gannon and his wife, Shelley, have two daughters. One daughter was diagnosed with celiac disease and her parents serve as national spokespeople for the Celiac Disease Foundation and organize an annual Celiac Walk at Holy Family Catholic High School in Victoria, Minnesota. Gannon is a practicing Roman Catholic. ^ White, Gordon (October 15, 1986). "Transfer quarterback key to success". The New York Times. p. B1. ^ Sigma Phi Epsilon (July 23, 2009). "Rich Gannon taking about SigEp". YouTube. Retrieved September 2, 2012. ^ a b "Rich Gannon". Oakland Raiders. Retrieved September 1, 2012. ^ "UD's Ben Patrick to play in Super Bowl". UDaily. January 20, 2009. ^ Price, Terry (October 17, 1991). "Vikings' Gannon Not Passed Over". The Hartford Courant. Retrieved September 2, 2012. ^ a b "Rich Gannon game logs, 1987". NFL. Retrieved September 2, 2012. ^ Alfano, Peter (January 4, 1988). "Vikings Smash Saints". The New York Times. Retrieved September 2, 2012. ^ "1987 Minnesota Vikings: Team Games & Schedule". pro-football-reference.com. Retrieved September 2, 2012. ^ "Rich Gannon game logs, 1988". NFL. Retrieved September 2, 2012. ^ "1988 Minnesota Vikings: Team Games & Schedule". pro-football-reference.com. Retrieved September 2, 2012. ^ "1989 Minnesota Vikings". pro-football-reference. Retrieved September 2, 2012. ^ "Rich Gannon game logs, 1989". NFL. Retrieved September 2, 2012. ^ "Minnesota Vikings 13 at San Francisco 49ers 41". pro-football-reference. Retrieved September 2, 2012. ^ George, Thomas (September 25, 1990). "Concern Over Quarterback Injuries". The New York Times. Retrieved September 4, 2012. ^ Associated Press (October 1, 1990). "Bucs' Christie Makes Coach Look Good". Los Angeles Times. Retrieved September 4, 2012. ^ "Rich Gannon Career Game Log". pro-football-reference.com. Retrieved September 4, 2012. ^ Associated Press (November 6, 1990). "Vikings 27, Broncos 22". The New York Times. Retrieved September 5, 2012. ^ a b "Rich Gannon game log, 1990". NFL. Retrieved September 4, 2012. ^ Associated Press (November 12, 1990). "Vikings Keep It Simple Against Lions, 17-7". Los Angeles Times. Retrieved September 5, 2012. ^ Associated Press (August 10, 1991). "Salisbury Moving Up With Vikings". Los Angeles Times. Retrieved September 5, 2012. ^ Associated Press (September 30, 1991). "Green Leads Broncos Over Vikings, 13-6". Los Angeles Times. Retrieved September 5, 2012. ^ "Rich Gannon game logs, 1991". NFL. Retrieved September 5, 2012. ^ Goldberg, Dave (August 23, 1992). "NFC Preview: Strength Is in the East". Los Angeles Times. Associated Press. Retrieved September 5, 2012. ^ Associated Press (August 30, 1992). "NFL EXHIBITION ROUNDUP: Vikings Roll to 30-0 Rout of Redskins". Los Angeles Times. Retrieved September 5, 2012. ^ Bagnato, Andrew (October 5, 1992). "No Denying Vikings In Dome, Sweet Home". Chicago Tribune. Retrieved September 2, 2012. ^ Associated Press (October 16, 1992). "Vikings Put Lions Away". The New York Times. Retrieved September 2, 2012. ^ "Rich Gannon game logs, 1992". NFL. Retrieved September 5, 2012. ^ Associated Press (November 24, 1992). "Vikings demote Gannon". The New York Times. Retrieved September 5, 2012. ^ Stellino, Vito (August 20, 1993). "Redskins obtain Vikings' Gannon". The Baltimore Sun. Retrieved September 7, 2012. ^ a b c d "Rich Gannon game logs, 1993". NFL. Retrieved September 7, 2012. ^ Stellino, Vito (October 5, 1993). "Redskins' QBs can't top Marino". The Baltimore Sun. Retrieved September 8, 2012. ^ Stellino, Vito (October 9, 1993). "Redskins say Gannon hampered by sore foot". The Baltimore Sun. Retrieved September 8, 2012. ^ Stellino, Vito (November 16, 1993). "Rypien out if Gannon is healthy". The Baltimore Sun. Retrieved September 8, 2012. ^ Simers, T.J. (November 22, 1993). "Rubley Takes Charge, Rams Beat Redskins". Los Angeles Times. Retrieved September 7, 2012. ^ Paolantonio, S.A. (November 29, 1993). "Eagles Salvage A Ray Of Hope". The Philadelphia Inquirer. Retrieved September 7, 2012. ^ "Washington Redskins 23 at Tampa Bay Buccaneers 17". pro-football-reference.com. Retrieved September 7, 2012. ^ Babineau, Jeff (December 6, 1993). "Brooks, Redskins Bowl Over Bucs". Orlando Sentinel. Retrieved September 8, 2012. ^ "Jets' Code: Something Still Beats Nothing". The New York Times. December 12, 1993. Retrieved September 8, 2012. ^ "New York Jets 3 at Washington Redskins 0". pro-football-reference. Retrieved September 8, 2012. ^ a b Associated Press (August 6, 2005). "Gannon retires after 18 seasons in the NFL". ESPN. Retrieved September 1, 2012. ^ Mayer, Larry (January 16, 2013). "Cutler 'couldn't be more excited' Bears hired Trestman". Chicago Bears. Retrieved January 16, 2013. ^ "Mind-blowing stats for Super Bowl XLVII". National Football League. January 30, 2013. Retrieved January 31, 2013. ^ "Passing yards through 14 games". ^ "Rich Gannon Stats". ESPN Internet Ventures. Retrieved March 10, 2014. ^ Football Nation (July 26, 2012). "Top 100 Quarterbacks 40-21". Football Nation. Archived from the original on October 30, 2012. Retrieved October 14, 2012. ^ Mugford, John (September 2011). "Rich Gannon: Lake Lover". Dockside Magazine. Archived from the original on February 24, 2014. Retrieved September 1, 2012. ^ Hrbacek, Dave (April 12, 2011). "Dads, doughnuts and the NFL". The Catholic Spirit. Retrieved September 1, 2012.